Barrel 23 is an extremely rare blend of Pinot Noir made exclusively for Michael Jordan’s personal wine cellar and his renowned steakhouses. In a world dominated by Cabernet Sauvignon, Barrel 23 is crafted to Michael’s personal specifications to pair perfectly with the high quality of meats served at his Michael Jordan’s Steakhouses. The vineyard blocks chosen for this specific blend represent some of Domaine Serene’s finest single-vineyard sites. This once-in-a-lifetime offering marks the first, and only, time that this unique and prestigious bottling has been made available to anyone other than the NBA legend himself. Long before the recent NBA wine culture was being covered by the major news networks, Michael Jordan and his team set out to work with a top producer on an exclusive blend of Pinot noir to fit Michael’s high standards for quality and style. With the help of Michael Jordan’s experienced sommelier and restaurant GM, Myron Markewycz, Domaine Serene has artfully blended some of the finest barrels from their award-winning Pinot noir program to create Barrel 23 exclusively for the NBA Legend and his Michael Jordan’s Steakhouses. Ultimately they created a centerpiece for his vast wine cellar and a bold offering to complement his fine dining establishments. The 2017 vintage Barrel 23 is likely to be the finest yet produced. In 1989 Grace and Ken Evenstad settled in the Northern Willamette Valley and established Domaine Serene. Their spirit and passion to produce wines that rival the great wines of Burgundy, led them to purchase and plant a hilltop estate that had just been logged in the now-famous Dundee Hills. Today, Domaine Serene produces wines from six individual vineyard estates, planted exclusively to Pinot noir and Chardonnay. The Evenstads now own nearly 1,000 total acres of land in the hills of Oregon’s Northern Willamette Valley, with 275 acres planted to vines. In just under three decades, the Evenstads have propelled Domaine Serene onto the global stage as one of the world’s most acclaimed and respected wineries. 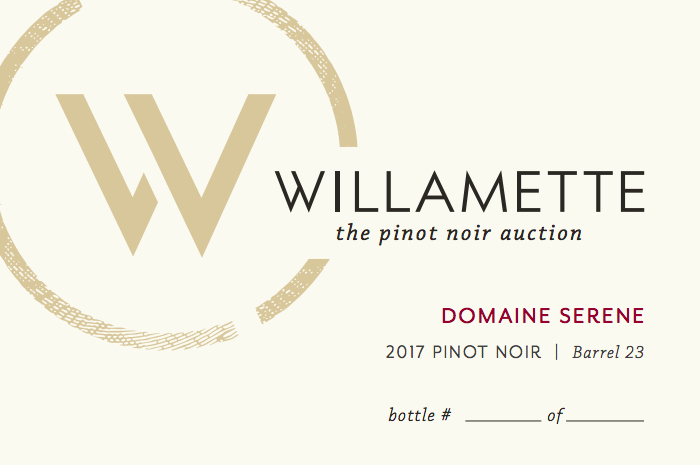 Domaine Serene’s wines represent the achievement that is possible in Oregon; one of the finest regions in the world for Pinot noir and Chardonnay.